When we last saw Shalltear, she was in human-appearance mode, slumped over slightly, eyes vacant. That image haunted me all week. She was such a powerful character, so full of life, that seeing her so broken hurt. What did such a state mean for our heroes? This week, the episode begins with Ainz Ooal Gown sitting on his throne in Nazarick. He was lamenting that he thinks he’ll need a god-level item to break whatever spell bound Shalltear. Narberal Gamma, who’s still in the field, reported that key adventurers in E-Rantel are alarmed at the appearance of a vampire nearby, and Ainz immediately recognized the description as Shalltear. This gave him a perfect cover story — he could offer his help as Momon the the adventurer, which meant he could help Shalltear and advance his reputation at the same time. I’m not sure how to interpret what happened next. As Ainz/Momon pitched his idea to face the vampire, one of the adventurers, jealous of Momon’s quickly-earned fame, demanded to go along on the hunt, ostentatiously to prove the vampire is as powerful as Momon claims. In reality, I suspect he wanted to kill Momon and fulfill the mission for his own glory. Defying Ainz/Momon? Add that to your top 10 list of things not to do. Capture from Funimation’s stream. Momon warned him that if the adventurer went, he and his team would die. What Momon didn’t make clear, however, was that Momon and his own team would kill the man. 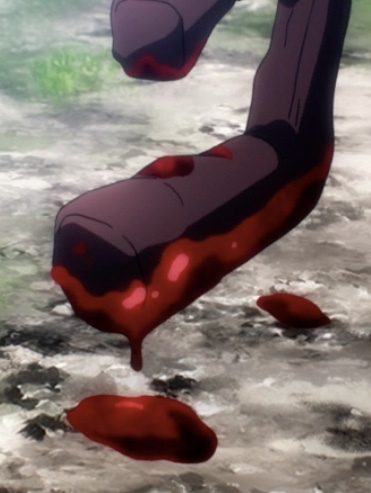 Ainz is the hero of this show, and seeing him brutally put down a foe like this left me feeling conflicted. On one hand, I had to admire his dedication to mission. On the other, I wonder if he should have spent some energy finding another way forward? I also had to admire his unwillingness to waste. He told Narberal to take the corpses back to Nazarick to see if they could turn them into high-level undead. The fact I’m worried about this tells me Overlord’s done a great job building realistic characters. Ainz took Albedo to face Shalltear. When they reached the vampire, Ainz was astounded to see that someone had attempted to put Shalltear, an undead, under mind control, but left her without orders. He attempted to use Shooting Star, a super tier magic spell, to break whatever bound her. When he tried it, though, his spell shattered without any affect on Shalltear. Time for plan B. What trumps super magic tier? Capture from Funimation’s stream. Ainz took Albedo and retreated immediately. He was furious with himself for not anticipating that this kind of thing could have happened. Shelter appeared to be lost; he had exposed Albedo to the same danger! That’s when he realized what could defeat super tier magic items: world level items. He hadn’t anticipated that this world could even produce such things. He ordered Albedo to pull all of their people back to the Tomb and fortify their positions. 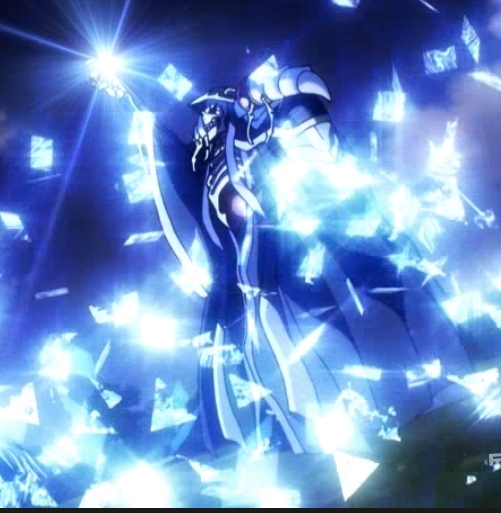 I like how Overlord’s revealing the world’s mechanics through Ainz’ perspective. He was an expert at the computer game, and that could have made him a god-like, uninteresting character. Instead, he’s struggling to come to terms with the new world. We get to see his doubt and frustration, and I like that! Drama’s cool. To prepare for the coming battle, he takes Albedo and one of the Pleiades Battle Maids (I still love that title) with him to the treasury. It was Albedo’s first visit, and the mass of wealth and items hoarded there overwhelmed her. What underwhelmed her was Pandora’s Actor, guardian of the treasury, who was obviously one of Ainz’ early NPC creations. I’m guessing that Ainz created Pandora’s actor before Ainz mastered facial textures. Capture from Funimation’s stream. Patterned vaguely after a German soldier in appearance and mannerisms, Pandora’s Actor was apparently in charge of their finances. 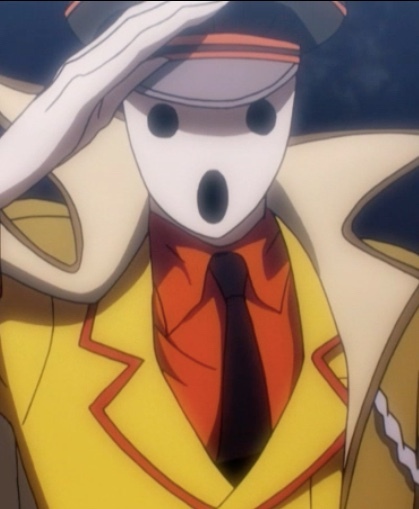 Albedo didn’t like him because “Lord Ainz himself” created the NPC. In the scene that followed, Ainz had to pull his treasurer aside to literally beg him not to speak in German or salute so much. This was after Ainz said to himself, “Woah! He’s so lame!” I think that Ainz was embarrassed in front of Albedo! In the very depths of the treasury, in what Ainz called the mausoleum, there were statues he had created of his old friends. Albedo asked if they were dead; he had to tell her that he didn’t really know. He had created the statues using his friend’s actual items. They had donated them to Ainz when they left the game. Unwilling to let them go, he created this testament to their memory. Instead of selling the items, as his friends intended, he kept them against the time his friends might return. This is the kind of thing that keeps me riveted to Overlord. She knows she’s an NPC, yet she’s completely dedicated to Ainz. He knows he’s just a kid who was playing a game, but he’s trying to come to terms with being the lord of powerful, dedicated people. He has no idea what he’s doing, but he’s not going to leave them. He’s going to stay in the fight. Her despair moved him. He may have already understood what he had to do to save Shalltear; or Albedo’s words may have helped clarify the situation. He had recognized that the threat wasn’t just to Shalltear, it was to Albedo, Nazarick, and everyone and everything he had built. I originally thought he had come to the treasury to get the world items to combat the forces that had ensnared Shalltear. No — he intended to give the world items to those who remained in Nazarick to keep themselves safe, while he confronted Shalltear. Alone. He wanted to prove to himself that he’s an adequate leader (over the objections of Albedo, of course!). Not foreseeing that other game players than himself might have made it into this world had shaken his confidence. He also realized the scenario might be a trap. Albedo isn’t thrilled with Ainz’ plan, but she trusts him to see it through. Capture from Funimation’s stream. Finally, he suspects that me might have to kill Shalltear, and he thinks he’s the only one among them that could do it. 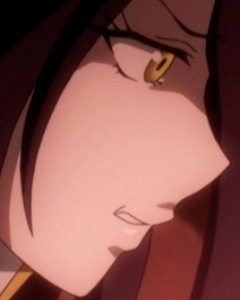 Albedo isn’t happy about the plan, and she convinced Ainz to promise he’ll return. After giving her a speech that I suspect was as much to reassure her as to pump himself up, he departs to fight Shalltear. And so the episode ends almost where it began, with a confrontation imminent with Shalltear. I think the next episode is the last one for season 1. Overlord’s impressed me so far. Who’s attacking the people of Nazarick? One of Ainz’ old friends? Will be bring Shalltear back alive — will he come back at all? I have high hopes that the next episode won’t let me down.